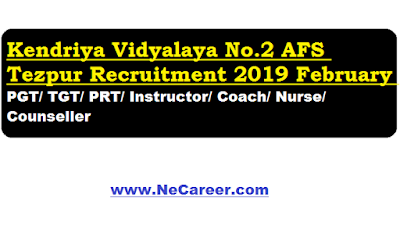 KV No.2 AFS Tezpur Recruitment 2019 February :- Hello dear job aspirants. Welcome to North East India's No. 1 Job Portal www.NeCareer.com . In this post we will mention a latest vacancy notification in the state of Assam. Kendriya Vidyalaya No. 2 Tezpur has published a recruitment notification 2019. 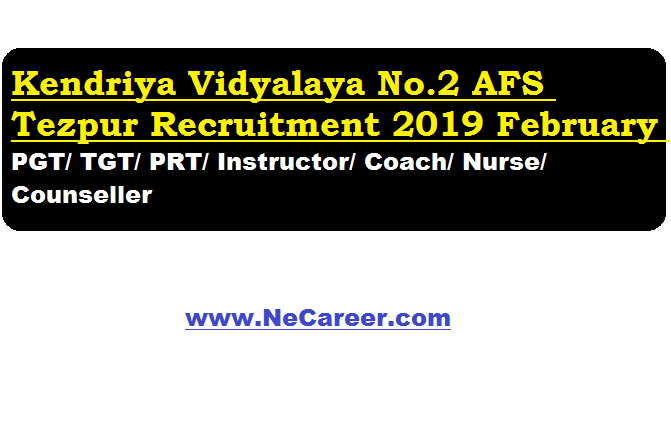 In order to empanel teachers on contractual basis for the session 2019-20 a walk in interview for all the below mentioned categories will be held at KV No.2, AFS Tezpur. Eligibility Criteria: For eligibility criteria please refer KVS HQ website. The candidates are requested to register latest by 10.02.2019 through the URL https://docs.google.com/forms/d/e/1FAIpQLSdJ7IoVNopOCVwxlBCg55fyupKOGhavke8shMxmB2P7kg_vdQ/viewform?usp=sf_link .